1. Preheat the oven to 170ºc, gas mark 3. Scatter the sliced onions and garlic in to the bottom of a roasting tin. 2. Mix the cumin, coriander, garam masala, chilli flakes and chopped rosemary together with the salt and pepper. Rub this onto all surfaces of the lamb, including the sides and the base. Sit the lamb on top of the onions. Pour the vinegar and stock into the base of the tray. 3. Cover with parchment and foil, then place in the preheated oven and cook for 3 – 3 1/2 hours. Uncover and return to the oven and cook for another 45 minutes, or until the lamb is falling off the bone. 4. Using two forks, pull the lamb away from the bone and shred the meat. Toss it with the onion and any juices. 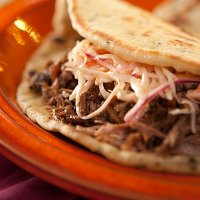 Serve with flatbreads and coleslaw. 1. Tip the flour into a large mixing bowl and add the salt to one side of the bowl and the yeast to the other. Add the Nigella seeds, the oil and 200ml of the water. Use the fingers of one hand to mix the ingredients together. 3. Oil a clean work surface. Tip the dough onto the oil and knead for 5-10 minutes. The dough will become less sticky and feel smooth and silky when ready. 4. Put the dough into a lightly oiled bowl. Cover until the dough has doubled in size. This will take between 1-3 hours. 5. Tip the dough onto a lightly floured surface. Fold it inwards repeatedly until all the air is knocked out and the dough is smooth. Divide the dough into 12 equal pieces. Roll each piece into a circle about 18cm in diameter. 6. Heat a little oil in a frying pan over a medium heat. Fry each flatbread for 2-3 minutes on each side, until golden brown and puffy. If the heat is too high, the outside of the bread will burn and the inside will be raw. Leave to cool slightly before serving.